Welcome to THEVOW.ie - the new home for modern Irish weddings where brides, grooms and guests can find practical advice and brilliant ideas for the big day! 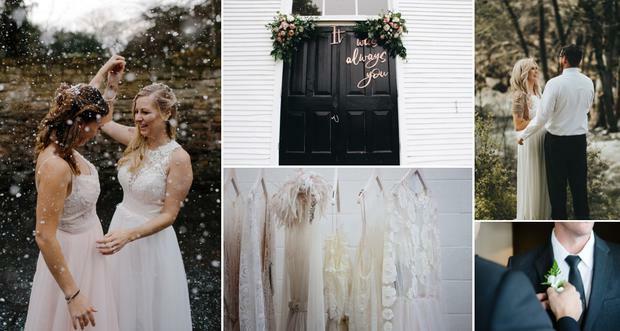 THEVOW.ie brings you the latest in ideas, inspiration, celebrity wedding access and news about the best wedding venues and suppliers around the country. We are always on the lookout for beautiful weddings to feature on the site and are excited to be able share real stories from brides and grooms in Ireland. If you are tying the knot soon - or have already said your vows - we want to hear from you! To share your wedding with our readers, simply mail editor@thevow.ie and tell us a bit about your big day. If you have some professional photos to share with us all the better! Send your favourite snaps of the day with the subject line 'real wedding' to editor@thevow.ie and we'll get back to you with anything else you need to know! Photographer, videographer or supplier? Scroll down to find out submission guidelines. You can also find us on Instagram - use the hashtag #THEVOW and we may regram your wedding photo from the weekend, or use it in our real wedding section on THEVOW.ie! Have you a brilliant video of your big day that's guaranteed to get people laughing? Or a great story of your stag that's begging to be told? Or have you got an opinion to share with other brides or grooms to be ahead of their big day? Email our editor at editor@thevow.ie with your story under the subject line 'wedding story' and we'll get back to you for more information! We will then send you a questionnaire to be filled out by the couple if the wedding is to be featured on the site. We also love to see gorgeous engagement shoots! So if you wish to submit this as a photographer or videographer, please send approx 10 individual images via a file sharing site such as wetransfer or dropbox to editor@thevow.ie. Questions? Simply mail editor@thevow.ie with any problems or queries and we'll get back to you ASAP! We are always on the lookout for 'something different', and love to receive beautifully styled fashion and decor shoots to showcase. To submit a shoot, please send us approx. 20 photos along with details of when and where the shoot took place as well as details of the suppliers involved through a file sharing site such as wetransfer or dropbox to editor@thevow.ie. If the shoot has been featured in another publication please let us know and please ensure you have the right to reproduce the photos. We only schedule content when we have received everything needed for a full feature. Please allow 4-8 weeks for real weddings to appear on the site once they are scheduled. We may not be able to contact interested parties directly when the featured goes live however we ask that you come back to visit us! We aim to promote our content across our social media channels. We can credit the supplier who has submitted the content on our Facebook and Instagram pages. Please ensure to add your social media handles to your submissions. Photos that appear on THE VOW may be shared by third parties. THE VOW is a an Independent.ie website under Independent Media/ INM.